This stretched hexagonal tower display is ready to ship and comes pre-assembled. It is available in black or light cherry laminate with black anodized aluminum framing. It features tempered glass and 4 halogen top lights, along with a mirrored deck. 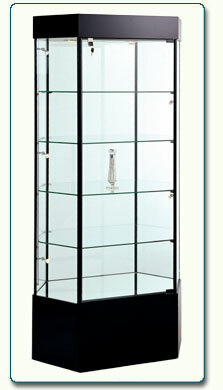 Loaded with tons of standard options, this unit is sure to meet your merchandising needs.